Welcome to DeNami product Spotlight! So glad you could join us today! We have a super cute set to share with you just in time for spring! I just love this little bird house! So cute! I started to make a little tiny card, like a 3x3 and then somehow got inspired to make some Fun foam clouds! I just cut out some random images and stamped them in white ink! The grass and those little bird houses are colored with Copics! You can see lots of other adorable creations at the DeNami blog! Thanks for coming by today! Aww...this is so sweet! This could very well be my first Denami purchase. I love this. This is adorable - super simple & sweet. Super cute! Love the bird houses hanging from the twine. Oh, and your foam clouds are awesome too. Oh I just love how you used the twine to hang the little bird houses! So cute! This is so cute! I love the bird houses hanging from the twine! Adorable! This card is utterly amazing, Laurie. I love how you used the birdhouses with the twine- so completely genius! Also, the sentiment you chose goes so well with this card! 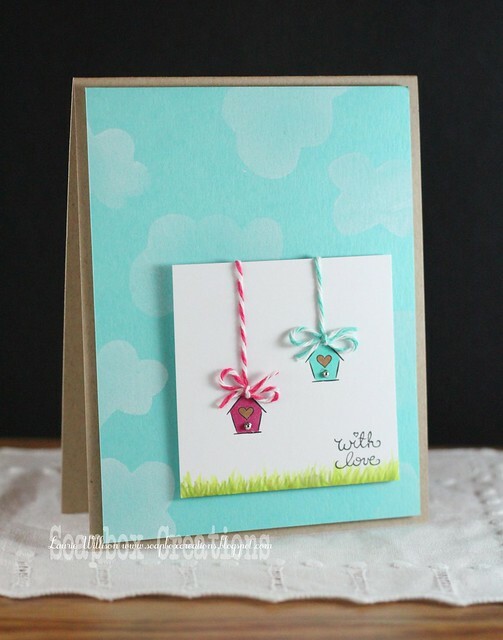 Such a fresh and springy card, Laurie!! Love how you hung the birdhouses with twine and your foam clouds turned out AWESOME!!! Such a soft CAS card! Love the pastel colors! OK, that is beyond cute. It's kind of ridiculous how cute it is, really. Love the vibrant colours. Lovely! Your cards truly inspire me, Laurie. I'm so glad I found your blog!! Where are the chickies? :) I love that you took another image from this tiny set and make a fantastic card! Love those mini birdie houses hanging from twine! What a brilliant card Laurie! Love the twine hanging the birdhouses! And the background is amazing! Love those soft clouds!! !